Portugal's southern coastal region, the Algarve, is a well-known international tourist centre. Faro is the provincial capital of the Algarve located 60 km from the Spanish border. The city was founded by the Moors. The east and west side of Faro has a Wadden look alike coast line. This is area is called Reserva Natural da Ria Formosa, consist out of lagoons with salt hollows. The inlands behind this coast line are flat to light sloping. You can find alot of market gardening with almond, orange, fig trees. Near Praia da Falesia the character of the coast line changes dramatically. No more wads but interesting rocks rising straight up out of the Atlantic Ocean. In this part of the Algarve you can find small fishing villages, long golden beaches, extraordinary rock formations and isolated beaches protected by cliffs and rocks. Further inland are hill villages, market towns and agricultural landscapes. 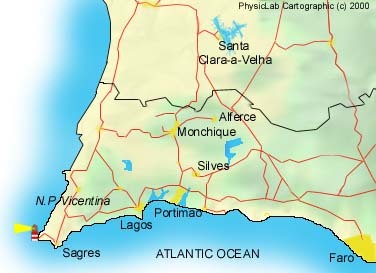 Some towns and villages on the Algarve coast: Lagos, Albufeira, Olhão, Tavira, Cacela Velha, Monte Gordo, Vila Real de Santo António, Portimão, Sagres. More inland: Lagoa, Porches, Loulé, Almancil, Estói, São Brás de Alportel, Castro Marim. Further inland: Monchique, São Bartolomeu de Messines, Silves, Alcoutim.